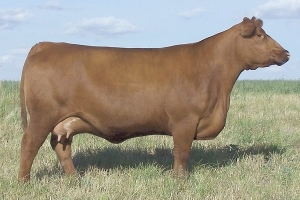 We acquired this herdsire at the breed altering Jackson Cattle Co dispersal. He was a standout bull calf that day that displayed a tremendous hip and powerhouse performance. 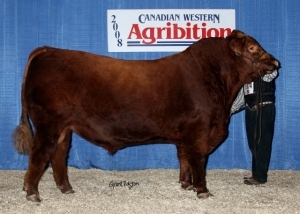 His dam is the many times show champion who sold for $21,000 to Hook’n Ladder that day and later traded to Blair.Ag during the fall of 2007. Equity stood at side of this tremendous female when they were awarded the Reserve Champion Female distinction at Canadian Western Agribition 2006. The maternal strength of Equity’s parentage is loaded with exemplary angus brood cows. Equity’s ability to transmit his type, performance and breeding potential along to his offspring was second to none. His daughters are deep, wide and open ribbed with beautiful udder development at a young age. His sons were extremely correct and were very well received by commercial cattlemen.